Welcome to Howling Wolf Adventures! 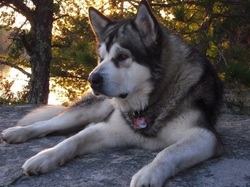 Howling Wolf specializes in adventures catering to both humans and their canine family members. We know your dog is your favorite buddy, and what better way to bond together in your dog's natural habitat? We teach you all the ins and outs of introducing you and your dog to the great outdoors! This adventure company is located east of the Twin Cities metro area of Minneapolis and St. Paul, MN. We will provide you with everything you will need for your wilderness adventure, taking all the stress out of the preparation of your trip in regards to gear and planning! 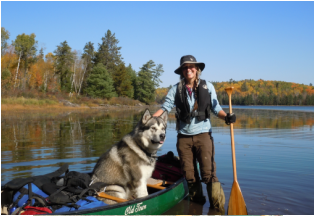 We offer a wide variety of activities for you to enjoy with your pooch, ranging from simple hikes to more complex overnight canoe trips. Each activity is designed with canines in mind, and offers you the best opportunities to enjoy natural spaces with your canine friend and to interact with other like minded dog lovers. If your dog spends his days in a box, we can help lift the lid for you to explore new avenues for you to get outside and enjoy the natural spaces with your dog. Your dog will thank you for allowing him to get back to his ancestral roots and will dream of being Canis Lupis, the wolf, again until your next adventure with Howling Wolf! You do not need to own a dog to partake in our adventures, you just need to love dogs and crave adventure. Our resident canoe dog, Moose, will be happy to show you his excellent canoe balancing techniques for your viewing pleasure. You will have a howling good time!